Shouldn't You Tell Them About The Dog? Jim and Rachel bought the small house a little over a year ago. They decided to simplify life and scale down from their larger house. At the party Jim told me about a rather quirky thing that came up at closing. Jim and Rachel were sitting at the table across from the real estate guy and the banker and whomever else was involved in the closing, when one of them turned to the other and said, "Shouldn't you tell them about the dog?" Seems that, though this little house is very old, Jim and Rachel are only its third owners. The first owners had an ill child (they didn't say the exact nature of the illness) who owned a dog that she dearly loved. Loved SO much, in fact, that her taxidermist dad stuffed the dog when it died so that they could keep the dog "forever". Okay, that was weird enough. But it gets even weirder. The second owners of the house kept the stuffed dog, presumably so that the dog would always be home. And I guess if you're eccentric enough to keep a stuffed dog in "its" house as a matter of honor -- doing right by the dog, it might never occur to you that the next owner wouldn't feel similarly sentimental and honorable and keep the dog at home as well. And so it was that Jim and Rachel inherited the dog. Jim and Rachel are the kindest, gentlest sort of people, living in a community (Goshen, IN) of exceedingly kind and gentle people. But they couldn't see themselves living with a stuffed dog standing around the house, no matter how relatively well-behaved it may have been as a pet. So they first tried to see if they could find any "proper" way to send the dog off to some place where it would maintain the dignity of a dog so loved that not just one, but two families made it their pet, despite considerations of viability. They even tried to see if the Goshen Historical Society had any interest in the dog (They didn't. Apparently, it held no historical significance, even if it was probably the oldest standing dog in the city). They thought and thought about it. How could they do the right thing? What WAS the right thing? They finally came up with a swell solution. They held a neighborhood/community funeral for the dog. They had several speakers who eulogized this special dog and his virtues: "He was such a good dog. He never bit anyone." "We never had to clean up our yards after him" "I thought I heard him barking once, but figured out that it was a different dog, 'cause he'd never bark in the middle of the night". Jim closed the service with a prayer, "Watch over him, God. He was a good companion to all who lived here. Now welcome him to a new home in heaven. Maybe let him stretch his legs a bit." And then he buried him out beyond the deck he'd just built. There was great music, and Pete Miller brought a granite slab to lay on his grave. Then Jim and his musical friends got out their instruments and the whole block celebrated the wake. Goshen is a very interesting town. If you've been out in the garden lately, you're more aware than a calendar gazer of just how far along the year is. The gourds are on the vine and they're getting color! Won't be long (I say as a guy whose favorite season of the year has always been autumn)! 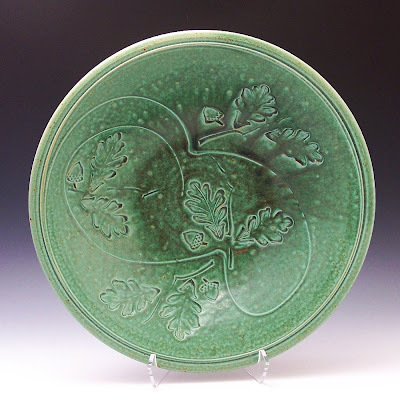 I know you're saying to yourself, "John Bauman making a less-than-serious piece of pottery? 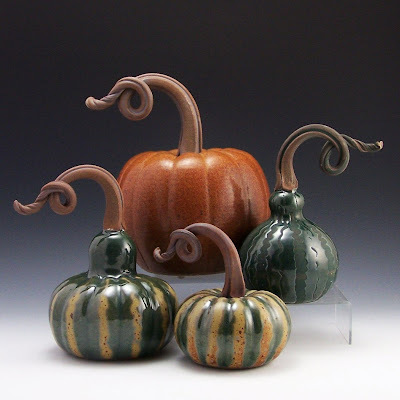 John Bauman adding whimsy to his pottery? Forsooth?" Okay, maybe you wouldn't say "Forsooth". I know I rarely use that word. But, yes. For about three months out of the year I turn some of my pumpkins into Jack O'Lanterns. I get a kick out of coming up with different faces, expressions, shapes. And I like the way I can make them relate to each other. Sure, it's a LITTLE weird to be working in the shop late at night and have a whole warecart of pumpkin faces staring at me as I work. But it's not as though I can hear them talking to me. Not often, anyway. Besides, singing isn't technically "talking". I've had dozens and scores.......maybe even hundreds of people tell me that they get these Jack O'Lanterns out in late summer and turn the face against the wall -- enjoying the plain side until October. Then they turn it around, enjoy being haunted by the face for the month of October. Finally, they turn it back around and enjoy the back side again until winter comes. 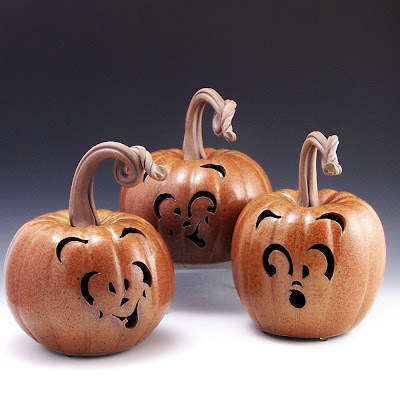 With or without the face, they look great with my gourds or in groups of Jack O'Lanterns too! Each Jack O'Lantern comes with a clip-in light cord and bulb so that the face can be lighted from within. Each Jack O'Lantern is thrown on my potter's wheel. The stem is a hand-pulled handle. Ann Arbor was just great last week. 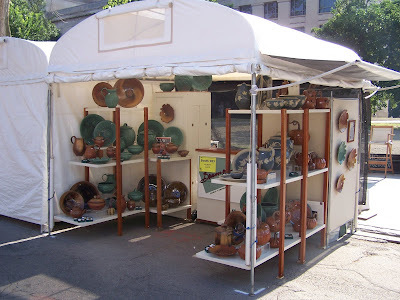 It was four busy days of meeting art fair regulars, artist friends, and selling lots of pots. But in getting ready for it, I decided to kill two birds with one stone. I decided to clear off most of my etsy page to give me more to sell at the show (worked too! 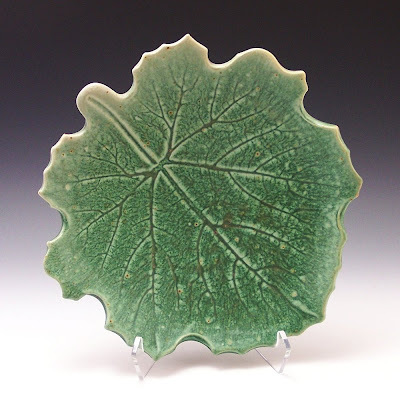 ...in Ann Arbor I sold everything that had been on my etsy page), and give me the chance and the incentive to upload some new pieces to the etsy page. By the middle of August, I should have the etsy page with a respectable number of pieces. It was late in the day – Thursday – at Ann Arbor. I had been holding a purchase for a woman most of the day. 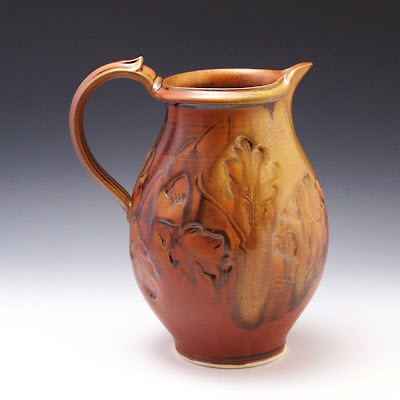 She returned to my booth to pick up her pottery. Probably due in part to tired feet from a day of walking the streets of Ann Arbor, but mostly because she was wearing those Teva sandals with the "CurbCatcherTM" toe platform.... You know the ones? …You lift your foot high enough to clear a stair step, but the toe of the sandal remains in EXACTLY the proper position to stay below the step, and momentum puts you face down on the upper step? The bio-ergonomic engineers must have logged overtime hours to design a sandal such that the exact proper distance remains between toe and sandal to cause disaster. I think they measure the distance between the bottom of the toe and the top of the sandal with “calamity calipers”. Anyway, this poor woman’s sandal caught the curb at the back of my booth and she went down. Hard. And it was LOUD too. Everyone thought that the horrid sound that was part thud, part bang, and part CRACK! …was her head hitting the pavement. Fortunately it was not. It was the explosion of the pottery bowl she had been cradling in her arms. The bowl hit the pavement just as she did. My wife, and friends the woman was with, rushed to her assistance. She kept saying “I’m okay. I’m okay……..I’m just embarrassed!” I believe the term is “mortified”. And she really did seem to be okay, despite the extremely loud bang that accompanied her fall. She was, as she said, just really embarrassed. …and a bit broken-hearted. The bowl in her arms was shatters and shards. She really liked it. After a short discussion with her friends that I only partly overheard, I gathered that she decided to go back to the other potter and see if by ANY chance that potter still had another bowl like the one she’d just dashed to pieces. Well, about twenty minutes later the woman returned. She seemed a bit recovered, and, to her joy, the other potter still had a replacement bowl. She held up the paper bag (presumably holding the replacement) as she smiled and told of this good fortune. Well, it was at that point that I turned around to retrieve the package that she’d left with me for the day. But as I turned my back to the woman, I heard again that sickening combination of part thud, part bang, and part CRACK! Have you all seen that Hallmark birthday card? …the cover is the whole thing… It pictures a room full of birthday partiers who have presumably just yelled SURPRISE!!! And standing by the open door, just inside the room is the birthday boy’s wife who is asking, “Were you surprised? !” …IN the doorway stands the birthday boy. His trousers are soaked in the…er…"zip-u-lar” region. Well, I can tell you……..my bladder held like a champ. But not for want of impulse. The crash scared the ever-lovin’ hell outta me. And as I turned around I saw that the lady who had earlier fallen was laughing…..as were the growing number of people standing around who were catching onto her joke. Soon I was laughing too... She had waited until I turned to retrieve her package and then had purposely dropped the already broken bowl to the pavement. With her sense of humor, she had turned her embarrassment into the funniest thing that happened to me the whole weekend.